Loose-leaf Links is a feature where I gather together the interesting bits and pieces on sci-fi, fantasy and romance I’ve come across and share them with you over tea. Today’s tea is Miss Grey from Adore Tea. 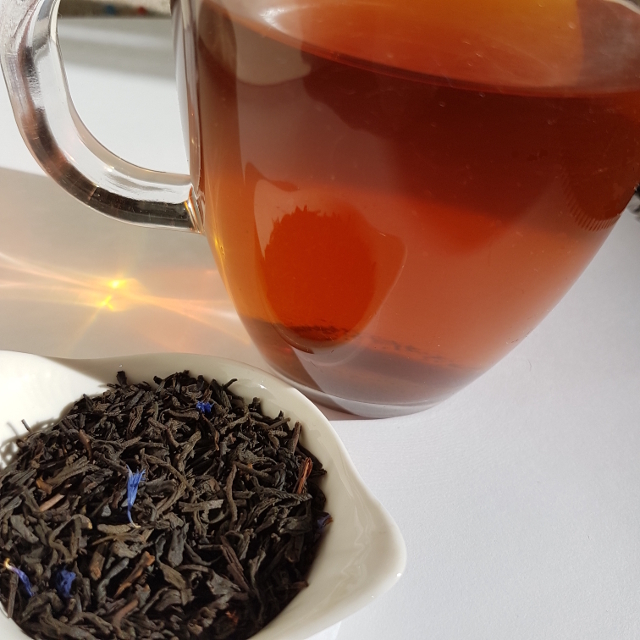 Although the stated ingredients appear to be the same as Earl Grey Blue Flower from The Tea Centre, there’s a muskiness that suggests the presence of lavender. Over at Book Riot, Alex Acks gives a round-up of this year’s changes to the Hugo Award rules. Speaking of the Hugos, Worldcon 75 has posted Henry Soderlund’s portraits of the finalists, as well as the con’s Guests of Honour. Applications for the Tiptree Fellowships are currently open. These are $500 grants for emerging creators who are changing the way we think about gender through speculative narrative. The deadline is 15 September. File 770 rounds up Delilah S. Dawson’s safety advice for those attending Dragon Con and follows on with the organisers’ response. Paul Weimer discusses his experiences with the Down Under Fan Fund (DUFF) and talks with Mary Robinette Kowal about his favourite bit. Back at Book Riot, Amanda Kay Oaks shares how you can support libraries damaged by Hurricane Harvey. Hoo boy. Okay, so if you haven’t heard about the controversy surrounding Lani Serem’s Handbook for Mortals, this article from Kayleigh Donaldson is a good place to start. It appears there was a shady attempt to get this book (which no one–especially in the YA community–appears to have heard of) to the top of the New York Times bestseller list. Its success was short-lived, with Angie Thomas’s The Hate You Give being quickly reinstated in top spot. Unsurprisingly, Sarem lashed out. Having the cover ripped off another artist (Gill Del-Mace), hasn’t helped her case. Del-Mace has responded via his agent. There were even accusations that the text was plagerised from a notorious piece of fanfic called My Immortal. This prompted the author of My Immortal to step forward and deny this, though there has since been doubt cast as to whether the statement is authentic. Yoon Ha Lee discusses the drawbacks of the Own Voices movement. Over at the Tor/Forge blog, two contributors to Iraq + 100 reflect on science fiction in Arabic literature. coeur de lion will be open from submissions during the month of October to stories 4.5K to 40K. Peter Ball suggests networking is one of the most important activities for writers. Over at the Book Smugglers, Barbara Morais talks about the necessity of being familiar with culturally different forms of narrative. Erik Jensen ponders what makes a fantasy world feel European. Meanwhile, Anise K. Strong feels that divorce should be an option in fantasy fiction. There are a ton of great Kickstarters underway at the moment. Augur Magazine is currently looking to fund their first two years of publication. The Book Smugglers are likewise Kickstarting their next season of publications, which will feature the theme Awakenings. And Ticonderoga Publications is Kickstarting their forthcoming anthology Ecopunk!. The Australian Reading Hour takes place on 14 September. The R.eaders I.mbibing P.eril reading challenge is currently underway and will run until 31 October. If you like horror, dark fantasy, mysteries or Gothic literature, it’s not too late to sign up. The Australian Romance Readers Association is looking for Australian romance readers to fill in their survey. Emily St John Mandel has written a follow-up to Station Eleven. Jessica Pryde has some self-published romance recommendations. Rachel Cordasco suggests some Chinese speculative fiction in translation to check out. There has been much ado about fantasy maps recently. Paul Weimer rounds up a few of the articles and contributes his own thoughts. And Kat Clay has six rules for giving away your books. I really need some of these. Especially #2. BUT DID YOU SEE that now the My Immortal author has a MEMOIR coming out about the fic and how it was involved with her life at the time? In the foster care system? It looks amazing and I am enthralled, and apparently Macmillan’s legal department did a bunch of verification to make sure she’s really who she says she is. And honestly if the whole thing turns out to be a scam that will sort of be even BETTER. What a great world. No, I hadn’t seen that! Pretty cool, though. I don’t suppose you have a link?